Discussion HRAS gene is not unique in hg38? HRAS gene is not unique in hg38? I would like to mention an unusual problem I run into when doing variant calls on thyroid cancer sample with HRAS Q61R mutation (see attached IGV screenshot. Mutect2 did not call this obvious variant. On further investigation it turns out that HRAS gene as well as few genes around it are aligned by BWA with mapping score of 0 and these reads expectedly are ignored by MuTect2. It seems BWA assigns zero score the the reads that cannot be mapped uniquely. 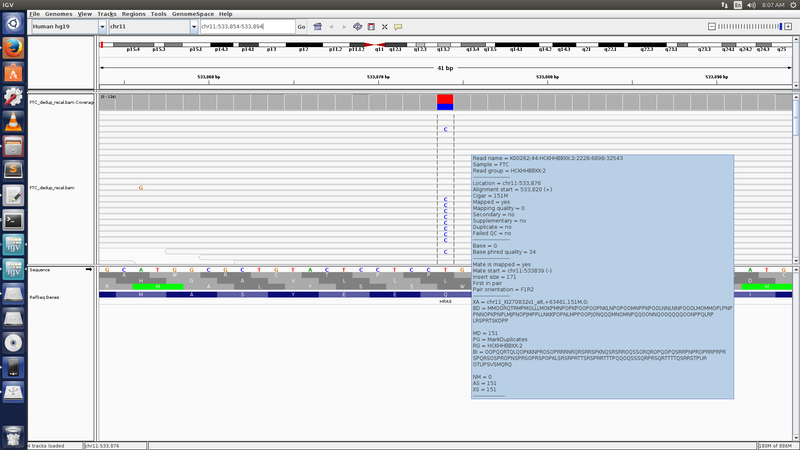 Does it mean that hg38 genome assembly has a duplicate of this chr11 part for some reason? I solved the problem by aligning to hg19 that showed unique mapping of HRAS gene sequences and HRAS mutation was called correctly by MuTect2. This could be due to alt contigs. Did you make the BWA alignment with alt-aware mapping? This is it! Thank you very much for the tip. Indeed, I run bwa mem directly but should have used run-bwamem script to skip alt contigs. Will try this.